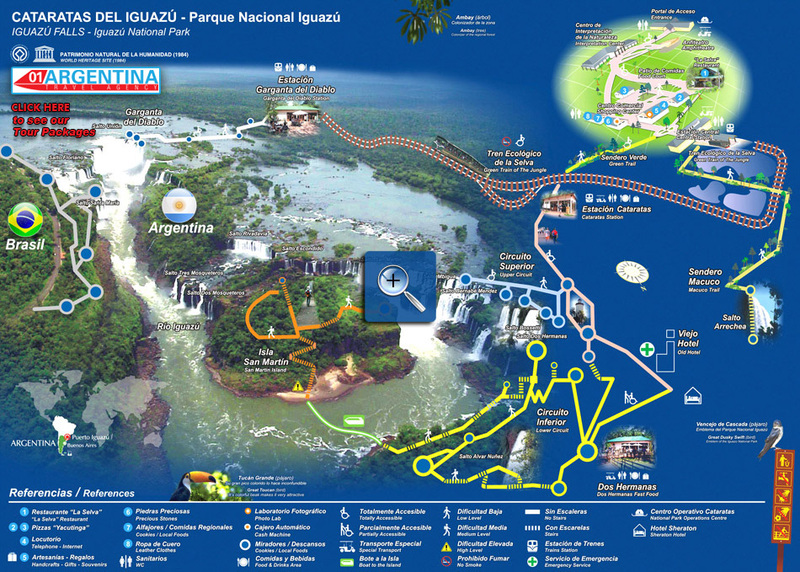 Useful Information and description of Iguazu Falls National Parks The Iguazu National Park in Argentina, was established in 1934 in order to protect some 60 000 hectares (over 7000 other nature reserve) where they settle Iguazu Falls. Sited on the border between Argentina and Brazil, are World Natural Heritage Site since 1984 and Nature wonders of the world since 2011. Discovered in the sixteenth century by the so-called "civilized world", the falls form a semicircle of 2700 meters with lots of waterfalls and cascades of 40-80 meters a fault product, 12 million years ago. The park also has the attraction of the large expanse of native subtropical forest, home to about 2,000 plant species, among which are epiphytes, such as orchids and bromeliads, favored by the high humidity in the vicinity of the jumps. The islands are populated by plant species that can not be found elsewhere in the park like forests and Yvirá Catú Cupay. The jungle and the river provide shelter to around 450 species of birds (toucans, humming birds, buzzards, macucos, carpenters, etc..) 80 mammals (anteater, peccaries, jaguar, etc..) And many reptiles, amphibians and fish, as well as the many forms of invertebrates among which highlights the large number of butterflies. For all this it is advisable to walk quietly through the trails and enjoy the sounds, smells, footprints and movements of the inhabitants of the jungle. On the Brazilian side there is also a national park about 185 thousand hectares to protect aspects of the falls and surrounding jungle. The view from Brazil is more panoramic but in the Argentine side you can have better feelings since you are almost on the water. In both parks it is possible to take the boat ride but only on the Brazilian side depart the helicopter rides. Also both parks charge entrance fees to enter, inside the National Parks there are many restaurants where you can buy fast food and drinks. All the catwalks are accessible for everyone including handicaps, and in both sides there are emergency services.